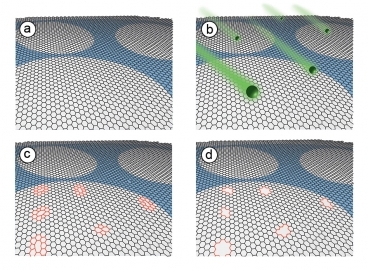 The MIT researchers used a four-step process to create filters from graphene (shown here): (a) a one-atom-thick sheet of graphene is placed on a supporting structure; (b) the graphene is bombarded with gallium ions; (c) wherever the gallium ions strike the graphene, they create defects in its structure; and (d) when etched with an oxidizing solution, each of those defects grows into a hole in the graphene sheet. The longer the material stays in the oxidizing bath, the larger the holes get. Image courtesy of the researchers. “We bombard the graphene with gallium ions at high energy,” O’Hern says. “That creates defects in the graphene structure, and these defects are more chemically reactive.” When the material is bathed in a reactive oxidant solution, the oxidant “preferentially attacks the defects,” and etches away many holes of roughly similar size. O’Hern and his co-authors were able to produce a membrane with 5 trillion pores per square centimeter, well suited to use for filtration. “To better understand how small and dense these graphene pores are, if our graphene membrane were to be magnified about a million times, the pores would be less than 1 millimeter in size, spaced about 4 millimeters apart, and span over 38 square miles, an area roughly half the size of Boston,” O’Hern says. The resources needed to support a future global population of more than nine billion people requires near-term action. At Lockheed Martin, we are in the business of protecting nations and providing vital citizen services; we are also in the business of engineering solutions to protect our planet. (Nanowerk Spotlight) Carbon comes in many different forms, from the graphite found in pencils to the world’s most expensive diamonds. In 1980, we knew of only three basic forms of carbon, namely diamond, graphite, and amorphous carbon. Then, fullerenes and carbon nanotubes were discovered and, in 2004, graphene joined the club. Graphene is an atomic-scale honeycomb lattice made of carbon atoms. Existing forms of carbon basically consist of sheets of graphene, either bonded on top of each other to form a solid material like the graphite in your pencil, or rolled up into carbon nanotubes (think of a single-walled carbon nanotube as a graphene cylinder) or folded into fullerenes. Graphene production The quality of graphene plays a crucial role as the presence of defects, impurities, grain boundaries, multiple domains, structural disorders, wrinkles in the graphene sheet can have an adverse effect on its electronic and optical properties. In electronic applications, the major bottleneck is the requirement of large size samples, which is possible only in the case of CVD process, but it is difficult to produce high quality and single crystalline graphene thin films possessing very high electrical and thermal conductivities along with excellent optical transparency. Another issue of concern in the synthesis of graphene by conventional methods involves the use of toxic chemicals and these methods usually result in the generation hazardous waste and poisonous gases. Therefore, there is a need to develop green methods to produce graphene by following environmentally friendly approaches. The preparation methods for graphene should also allow for in-situ fabrication and integration of graphene-based devices with complex architecture that would enable eliminating the multi step and laborious fabrication methods at a lower production cost (read more: “Mass production of high quality graphene: An analysis of worldwide patents”). Currently, the most common techniques available for the production of graphene are shown schematically below, which includes micromechanical cleavage, chemical vapor deposition, epitaxial growth on SiC substrates, chemical reduction of exfoliated graphene oxide, liquid phase exfoliation of graphite and unzipping of carbon nanotubes. However, each of these methods can have its own advantages as well as limitations depending on its target application(s). In order to surmount these barriers in commercializing graphene, concerted efforts are being made by researchers at various R&D institutes, universities and companies from all over the globe to develop new methods for large scale production of low-cost and high quality graphene via simple and eco-friendly approaches. Energy Graphene-based nanomaterials have many promising applications in energy-related areas. Just some recent examples: Graphene improves both energy capacity and charge rate in rechargeable batteries; activated graphene makes superior supercapacitors for energy storage; graphene electrodes may lead to a promising approach for making solar cells that are inexpensive, lightweight and flexible; and multifunctional graphene mats are promising substrates for catalytic systems. These examples highlight the four major energy-related areas where graphene will have an impact: solar cells, supercapacitors, lithium-ion batteries, and catalysis for fuel cells. An excellent review paper (“Chemical Approaches toward Graphene-Based Nanomaterials and their Applications in Energy-Related Areas”) gives a brief overview of the recent research concerning chemical and thermal approaches toward the production of well-defined graphene-based nanomaterials and their applications in energy-related areas. The authors note, however, that before graphene-based nanomaterials and devices find widespread commercial use, two important problems have to be solved: one is the preparation of graphene-based nanomaterials with well-defined structures, and the other is the controllable fabrication of these materials into functional devices. Read more about graphene nanotechnology in energy applications. Sensors Functionalized graphene holds exceptional promise for biological and chemical sensors. Already, researchers have shown that the distinctive 2D structure of graphene oxide (GO), combined with its superpermeability to water molecules, leads to sensing devices with an unprecedented speed (“Ultrafast graphene sensor monitors your breath while you speak”). Scientists have now found that chemical vapors change the noise spectra of graphene transistors, allowing them to perform selective gas sensing for many vapors with a single device made of pristine graphene – no functionalization of the graphene surface required (“Selective gas sensing with pristine graphene”). 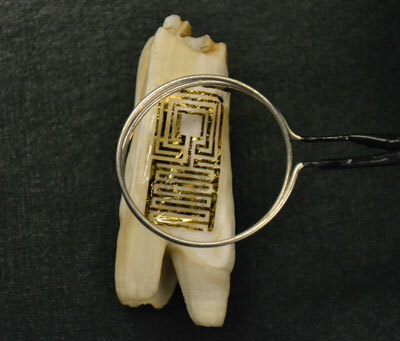 Quite a cool approach is to interface passive, wireless graphene nanosensors onto biomaterials via silk bioresorption as demonstrated by a graphene nanosensor tattoo on teeth monitors bacteria in your mouth. Researchers also have begun to work with graphene foams – three-dimensional structures of interconnected graphene sheets with extremely high conductivity. These structures are very promising as gas sensors (“Graphene foam detects explosives, emissions better than today’s gas sensors”) and as biosensors to detect diseases (see for instance: “Nanotechnology biosensor to detect biomarkers for Parkinson’s disease”). Flexible, stretchable and foldable electronics Graphene has a unique combination of properties that is ideal for next-generation electronics, including mechanical flexibility, high electrical conductivity, and chemical stability. Combine this with inkjet printing and you get an inexpensive and scalable path for exploiting these properties in real-world technologies (“Inkjet printing of graphene for flexible electronics”). 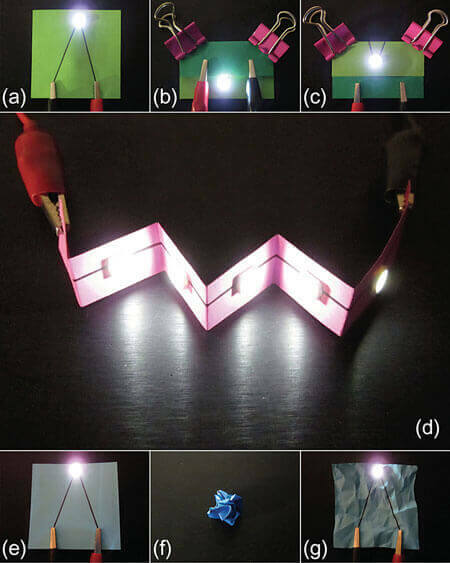 In contrast to flexible electronics, which rely on bendable substrates, truly foldable electronics require a foldable substrate with a very stable conductor that can withstand folding, i.e. an edge in the substrate at the point of the fold, which develops creases, and the deformation remains even after unfolding. That means that, in addition to a foldable substrate like paper, the conductor that is deposited on this substrate also needs to be foldable. To that end, researchers have demonstrated a fabrication process for foldable graphene circuits based on paper substrates. Graphene’s remarkable conductivity, strength and elasticity has made it a promising choice for stretchable electronics — a technology that aims to produce circuits on flexible plastic substrates for applications like bendable solar cells or robotic-like artificial skin. Scientists have devised a chemical vapor deposition (CVD) method for turning graphene sheets into porous three-dimensional foams with extremely high conductivity. By permeating this foam with a siloxane-based polymer, the researchers have produced a composite that can be twisted, stretched and bent without harming its electrical or mechanical properties (“Graphene: Foaming for stretchable electronics”). 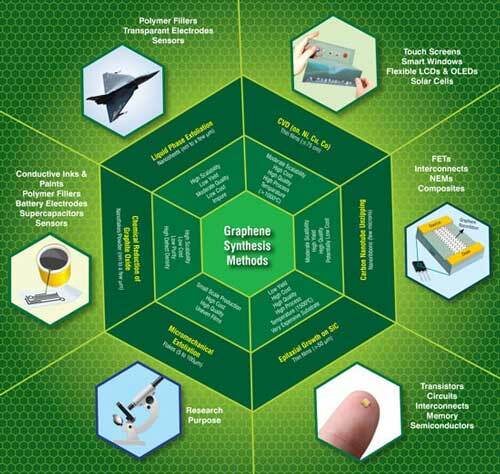 Nanoelectronics Some of the most promising applications of graphene are in electronics (as transistors and interconnects), detectors (as sensor elements) and thermal management (as lateral heat spreaders). The first graphene field-effect transistors (FETs) – with both bottom and top gates – have already been demonstrated. At the same time, for any transistor to be useful for analog communication or digital applications, the level of the electronic low-frequency noise has to be decreased to an acceptable level (“Graphene transistors can work without much noise”). Transistors on the basis of graphene are considered to be potential successors for the some silicon components currently in use. Due to the fact that an electron can move faster through graphene than through silicon, the material shows potential to enable terahertz computing. In the ultimate nanoscale transistor – dubbed a ballistic transistor – the electrons avoid collisions, i.e. there is a virtually unimpeded flow of current. Ballistic conduction would enable incredibly fast switching devices. 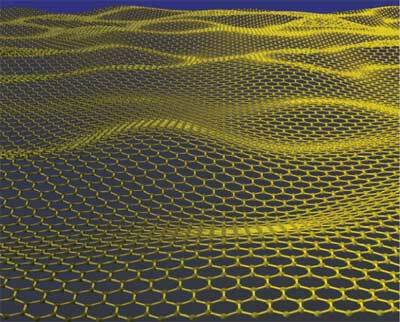 Graphene has the potential to enable ballistic transistors at room temperature. While graphene has the potential to revolutionize electronics and replace the currently used silicon materials (“High-performance graphene transistor with high room-temperature mobility”), it does have an Achilles heel: pristine graphene is semi-metallic and lacks the necessary band gap to serve as a transistor. Therefore it is necessary to engineer band gaps in graphene. Experiments have demonstrated the benefits of graphene as a platform for flash memory which show the potential to exceed the performance of current flash memory technology by utilizing the intrinsic properties of graphene. Photodetectors Researchers have demonstrated that graphene can be used for telecommunications applications and that its weak and universal optical response might be turned into advantages for ultrafast photonics applications. They also found that graphene could be potentially exploited as a saturable absorber with wide optical response ranging from ultra-violet, visible, infrared to terahertz (“The rise of graphene in ultra-fast photonics”). 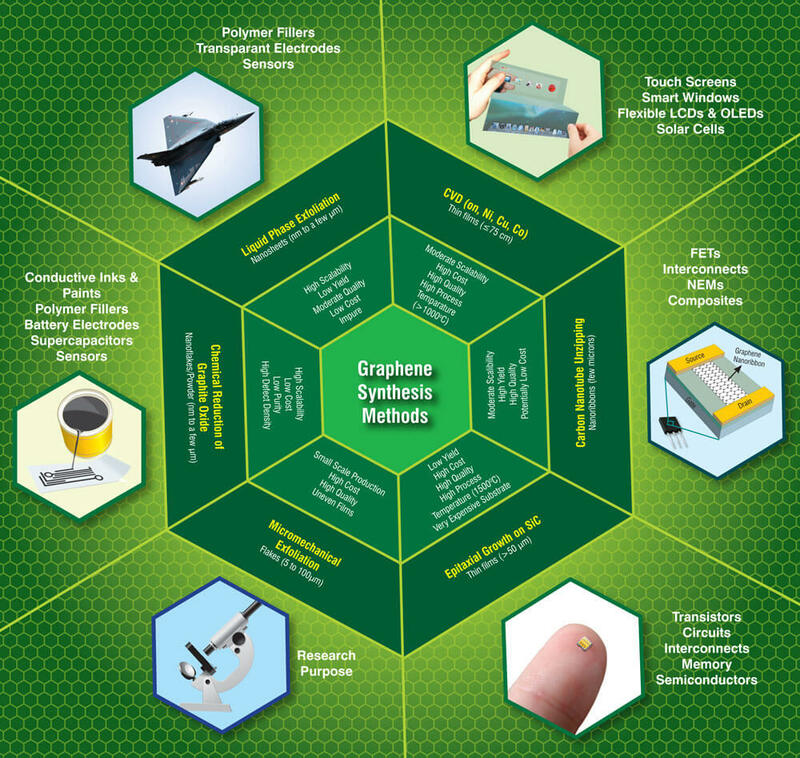 There is a very strong research interest in using graphene for applications in optoelectronics. Graphene-based photodetectors have been realized before and graphene’s suitability for high bandwidth photodetection has been demonstrated in a 10 GBit/s optical data link (“Graphene photodetectors for high-speed optical communications”). One novel approach is based on the integration of graphene into an optical microcavity. The increased electric field amplitude inside the cavity causes more energy to be absorbed, leading to a significant increase of the photoresponse (“Microcavity vastly enhances photoresponse of graphene photodetectors”). Coatings Coating objects with graphene can serve different purposed. For instance, researchers have now shown that it is possible to use graphene sheets to create a superhydrophobic coating material that shows stable superhydrophobicity under both static as well as dynamic (droplet impact) conditions, thereby forming extremely water repelling structures. Research findings also have established graphene as the world’s thinnest known coating for protecting metals against corrosion. It was found that graphene, whether made directly on copper or nickel or transferred onto another metal, provides protection against corrosion. Another novel coating application is the the fabrication of polymeric AFM probes covered by monolayer graphene to improving AFM probe performance. Other uses Researchers have exploited the extraordinary electrical and mechanical properties of graphene to create a very efficient electrical/sound transducer. This experimental graphene loudspeaker, without any optimized acoustic design, is simple to make and already performs comparably to or better than similar sized commercial counterparts, and with much lower power consumption. Recent research also points to an opportunity to replacing antibiotics with graphene-based photothermal agents to trap and kill bacteria. Graphene appears to be a most effective material for electromagnetic interference (EMI) shielding. Experiments suggests the feasibility of manufacturing an ultrathin, transparent, weightless, and flexible EMI shield by a single or a few atomic layers of graphene. Due to rapidly increasing power densities in electronics, managing the resulting heat has become one of the most critical issues in computer and semiconductor design. As a matter of fact, heat dissipation has become a fundamental problem of electronic transport at the nanoscale. This is where graphene comes in – it conducts heat better than any other known material (“‘Cool’ graphene might be ideal for thermal management in nanoelectronics”). Thermal interface materials (TIMs) are essential ingredients of thermal management and researchers have achieved a record enhancement of the thermal conductivity of TIMs by addition of an optimized mixture of graphene and multilayer graphene (“Graphene sets new record as the most efficient filler for thermal interface materials”). The concept of plasmonic cloaking is based on the use of a thin metamaterial cover to suppress the scattering from a passive object. Research shows that even a single layer of atoms, with the exciting conductivity properties of graphene, may achieve this functionality in planar and cylindrical geometries. This makes a single layer of graphene the thinnest possible invisibility cloak. Over the last decade, various solid lubricant materials, micro/nano patterns, and surface treatment processes have been developed for efficient operation and extended lifetime in MEMS/NEMS applications, and for various fabrication processes such as nanoimprint lithography and transfer printing. One of the important considerations in applying a solid lubricant at the micro- and nanoscale is the thickness of the lubricant and the compatibility of the lubricant deposition process with the target product. Graphene, with its atomically thin and strong structural with low surface energy, is a good candidate for these applications (“Graphene – the thinnest solid lubricant”). In the decades-old quest to build artificial muscles, many materials have been investigated with regard to their suitability for actuator application (actuation is the ability of a material to reversibly change dimensions under the influence of various stimuli). Besides artificial muscles, potential applications include microelectro-mechanical systems (MEMS), biomimetic micro-and nanorobots, and micro fluidic devices. In experiments, scientists have shown that graphene nanoribbons can provide actuation. A relatively new method of purifying brackish water is capacitive deionization (CDI) technology. The advantages of CDI are that it has no secondary pollution, is cost-effective and energy efficient. Researchers have developed a CDI application that uses graphene-like nanoflakes as electrodes for capacitive deionization. They found that the graphene electrodes resulted in a better CDI performance than the conventionally used activated carbon materials (“Water desalination with graphene”). Researchers demonstrated the use of graphene as a transparent conductive coating for photonic devices and show that its high transparency and low resistivity make this two-dimensional crystal ideally suitable for electrodes in liquid crystal devices (LCDs). IBM researchers have created a graphene-based circuit that they say performs 10,000 times better than existing options; It was reliable enough that they used it to send and receive a text message. They plan to publish their work in Nature Communications today. The circuit performs 10,000 times better than existing options and builds on an earlier proof-of-concept circuit IBM made in 2011. Graphene is an atom-thick sheet of carbon atoms renowned for its strength and conductivity. It is heralded as a possible alternative to silicon, which currently dominates electronics production. One of the major potential applications for graphene is transistors, which control the flow of electricity in circuits. The more transistors you can fit onto a chip, the more powerful it can be. Researchers should be able to pack far more atom-thick graphene transistors into a chip than the bulkier silicon alternative. Graphene also transports electricity 200 times faster than silicon. A completed graphene integrated circuit chip. Photo courtesy of IBM. The IBM team integrated graphene into a radio frequency receiver; a device that translates radio waves into understandable information that can be sent back and forth. They tested it by sending a text message that read “IBM” with no distortion. “This is the first time that someone has shown graphene devices and circuits to perform modern wireless communication functions comparable to silicon technology,” IBM Research director of physical sciences Supratik Guha said in a release. IBM created the first graphene-based integrated circuit back in 2011. The accomplishment proved that graphene could be used in electronics, but researchers also found that the circuits’ performance was negatively impacted by the harsh manufacturing process. That was a big problem considering nothing will replace silicon unless it can be safely manufactured in massive quantities. IBM scientists have been working since then on tweaking fabrication methods to better protect the graphene. The circuit announced today was made by adding the graphene only after the rest of the circuit was assembled, which means it is never exposed to the manufacturing steps that could damage it. It included three graphene transistors, whereas the 2011 circuit used just one. A view of the integrated circuit seen through a scanning electron microscope. 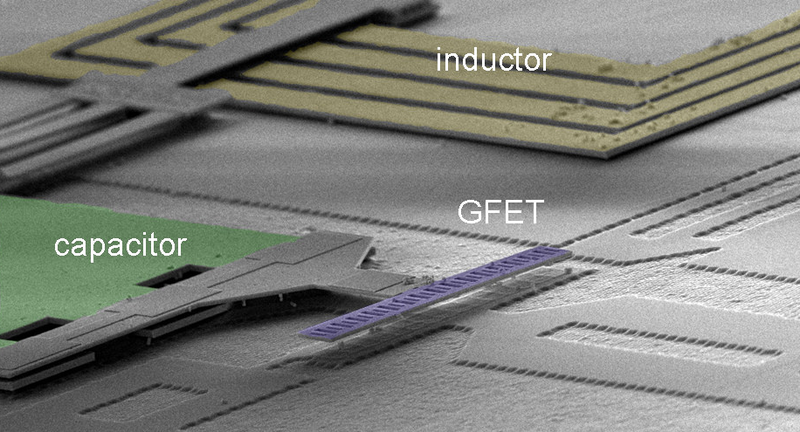 The graphene transistors are located in the purple area marked GFET. Photo courtesy of IBM. The team is particularly interested in how the technology could be used in wireless communications systems, though graphene could be integrated into any silicon-based technology. Mobile devices would potentially be able to transmit data more quickly at a lower cost using less power. One of the big remaining challenges is bringing the cost of graphene manufacturing down to the level of silicon. The IBM team manufactured graphene in an oven; a common technique. At high temperatures, graphene naturally pulls out of the air and deposits itself on surfaces. But it would be much cheaper if manufacturers could make graphene in larger batches at room temperature. Techniques like roll-to-roll manufacturing could soon make that a reality. On Monday, May 13th 2013, Professor Michael Chabinyc of the University of California Santa Barbara delivered a lecture entitled “Order and Charge Transport in Organic Solar Cells”. Using an approach akin to assembling a club sandwich at the nanoscale, NIST researchers have succeeded in crafting a uniform, multi-walled carbon nanotube-based coating that greatly reduces the flammability of foam commonly used in upholstered furniture and other soft furnishings. The flammability of the nanotube-coated polyurethane foam was reduced 35% compared with untreated foam. As important, the coating prevented melting and pooling of the foam, which generates additional flames that are a major contributor to the spread of fires. Nationwide, fires in which upholstered furniture is the first item ignited account for about 6,700 home fires annually and result in 480 civilian deaths, or almost 20% of home fire deaths between 2006 and 2010, according to the National Fire Protection Association. The innovative NIST technique squeezes nanotubes between two everyday polymers and stacks four of these trilayers on top of each other. The result is a plastic-like coating that is thinner than one-hundredth the diameter of human hair and has flame-inhibiting nanotubes distributed evenly throughout. The brainchild of NIST materials scientists Yeon Seok Kim and Rick Davis, the fabrication method is described in Thin Solid Films. Kim and Davis write that the technique can be used with a variety of types of nanoparticles to improve the quality of surface coatings for diverse applications. The pair experimented with a variety of layer-by-layer coating methods before arriving at their triple-decker approach. All had failed to meet their three key objectives: entire coverage of the foam’s porous surface, uniform distribution of the nanotubes and the practicality of the method. Inmost of these trials, the nanotubes—cylinders of carbon atoms resembling rolls of chicken wire—didn’t adhere strongly to the foam surface. So, Kim and Davis opted to doctor the nanotubes themselves, borrowing a technique often used in cell culture to make DNA molecules stickier. The method attached nitrogen-containing molecules—called amine groups—to the nanotube exteriors. This step proved critical: The doctored nanotubes were uniformly distributed and clung tenaciously to the polymer layers above and below. As a result, the coating fully exploits the nanotubes’ rapid heat-dissipating capability. Gram for gram, the resulting coating confers much greater resistance to ignition and burning than achieved with the brominated flame retardants commonly used to treat soft furnishings today. As important, says Davis, a “protective char layer” forms when the nanotube-coated foam is exposed to extreme heat, creating a barrier that prevents the formation of melt pools. “This kind of technology has the potential to reduce the fire threat associated with burning soft furniture in homes by about a third,” Davis says. WATERLOO, ON, Dec. 9, 2013 /CNW/ – A first-of-its-kind, world-class laboratory that could lead to the creation of quantum materials for use in a new generation of technologies will open at the University of Waterloo’s Institute for Quantum Computing (IQC) on December 12, 2103. Quantum materials are needed as the building blocks of robust quantum devices that will be able to function outside of laboratory settings bringing the possibility of a quantum computer one step closer. The lab houses a unique new $5 million tool to grow new materials that could form the building blocks of quantum technologies. The Government of Canada, Canada Foundation for Innovation, the Ontario Research Fund, industry partners and others helped fund the new lab. Media are invited to attend an event to open the laboratory. The event includes remarks from Professor Cory, and Professor Raymond Laflamme, executive director of Waterloo’s IQC. Tours of the new laboratory are available. Title: Quantum Dots Market by Product (QD Displays, Lasers, Medical Devices, Solar Cells, Chip, Sensor), Application (Healthcare, Optoelectronics, Sustainable Energy), Material (Cadmium Selenide, Sulfide, Telluride), and Geography – Forecast & Analysis (2013 – 2020). Quantum Dots (QD) are the types of semiconductor nanoparticles, which find their usage in multiple applications like healthcare, electronics, and so on. The current market of QD is at the pre-commercialized stage; most of the researchers are working on the “application aspects” of the QD technology, and deriving the products based on QD. 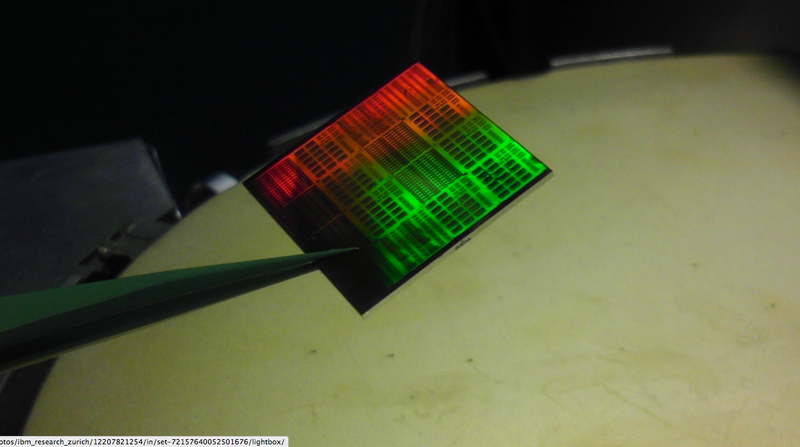 Researchers have studied the quantum dots in transistors, solar cells, LEDs, and diode lasers. They have also investigated quantum dots as agents for medical imaging and, soon, the QDs will be used as ‘qubits’ in quantum computing. This report deals with all the driving factors, restraints, and opportunities for the QD technology market, which are helpful in identifying the trends and key success factors for the industry. The report also profiles companies that are active in the field of QD technology. It also highlights the winning imperatives and burning issues pertaining to the QD technology industry. The Quantum Dots market is expected to grow from the $108.41 million that it accounts for, currently, in 2013 to $3,414.54 million in 2020, at a CAGR of 71.13% from 2014 to 2020. Optoelectronics application is expected to be the major market share holder, with an expected revenue generation of $2,458.47 million in 2020. PALO ALTO, Calif. — Not long after Gordon E. Moore proposed in 1965 that the number of transistors that could be etched on a silicon chip would continue to double approximately every 18 months, critics began predicting that the era of “Moore’s Law” would draw to a close. More than ever recently, industry pundits have been warning that the progress of the semiconductor industry is grinding to a halt — and that the theory of Dr. Moore, an Intel co-founder, has run its course. If so, that will have a dramatic impact on the computer world. The innovation that has led to personal computers, music players and smartphones is directly related to the plunging cost of transistors, which are now braided by the billions onto fingernail slivers of silicon — computer chips — that may sell for as little as a few dollars each. But Moore’s Law is not dead; it is just evolving, according to more optimistic scientists and engineers. Their contention is that it will be possible to create circuits that are closer to the scale of individual molecules by using a new class of nanomaterials — metals, ceramics, polymeric or composite materials that can be organized from the “bottom up,” rather than the top down. For instance, semiconductor designers are developing chemical processes that can make it possible to “self assemble” circuits by causing the materials to form patterns of ultrathin wires on a semiconductor wafer. Combining these patterns of nanowires with conventional chip-making techniques, the scientists believe, will lead to a new class of computer chips, keeping Moore’s Law alive while reducing the cost of making chips in the future. To do this, semiconductor manufacturers will have to move from the silicon era to what might be called the era of computational materials. Researchers here in Silicon Valley, using powerful new supercomputers to simulate their predictions, are leading the way. While semiconductor chips are no longer made here, the new classes of materials being developed in this area are likely to reshape the computing world over the next decade. Two years from now new factories for making microprocessor chips will cost from $8 to $10 billion, according to a recent Gartner report — more than twice as much as the current generation. That amount could rise to between $15 and $20 billion by the end of the decade, equivalent to the gross domestic product of a small nation. The stunning expenditures that soon will be required mean that the risk of error for chip companies is immense. So rather than investing in expensive conventional technologies that might fail, researchers are looking to these new self-assembling materials. In December, researchers at Sandia National Laboratories in Livermore, Calif., published a Science paper describing advances in a new class of materials called “metal-organic frameworks” or MOFs. These are crystalline ensembles of metal ions and organic molecules. They have been simulated with high-performance computers, and then verified experimentally. What the scientists have proven is that they can create conductive thin films, which could be used in a range of applications, including photovoltaics, sensors and electronic materials. The scientists said that they now see paths for moving beyond the conductive materials, toward creating semiconductors as well. According to Mark D. Allendorf, a Sandia chemist, there are very few things that you can do with conventional semiconductors to change the behavior of a material. With MOFs he envisions a future in which molecules can be precisely ordered to create materials with specific behaviors. “One of the reasons that Sandia is well positioned is that we have huge supercomputers,” he said. They have been able to simulate matrixes of 600 atoms, large enough for the computer to serve as an effective test tube. In November, scientists at the SLAC National Accelerator Laboratory, writing in the journal Physical Review Letters, described a new form of tin that, at only a single molecule thick, has been predicted to conduct electricity with 100 percent efficiency at room temperature. Until now these kinds of efficiencies have only been found in materials known as superconductors, and then only at temperatures near absolute zero. The material would be an example of a new class of materials called “topological insulators” that are highly conductive along a surface or edge, but insulating on their interior. In this case the researchers have proposed a structure with fluorine atoms added to a single layer of tin atoms. The scientists, led by Dr. Zhang, named the new material stanene, combining the Latin name for tin — stannum — with the suffix used for graphene, another material based on a sheet of carbon atoms a single molecule thick. The promise of such a material is that it might be easily used in conjunction with today’s chip-making processes to both increase the speed and lower the power consumption of future generations of semiconductors. The theoretical prediction of the material must still be verified, and Dr. Zhang said that research is now taking place in Germany and China, as well as a laboratory at U.C.L.A. It is quite possible that the computational materials revolution may offer a path toward cheaper technologies for the next generation of computer chips. That is IBM’s bet. The company is now experimenting with exotic polymers that automatically form into an ultrafine web and can be used to form circuit patterns onto silicon wafers. Dr. Narayan is cautiously optimistic, saying there is a good chance that bottoms-up self-assembly techniques will eliminate the need to invest in new lithographic machines, costing $500 million, that use X-rays to etch smaller circuits. .
“The answer is possibly yes,” he said, in describing a lower cost path to denser computer chips.